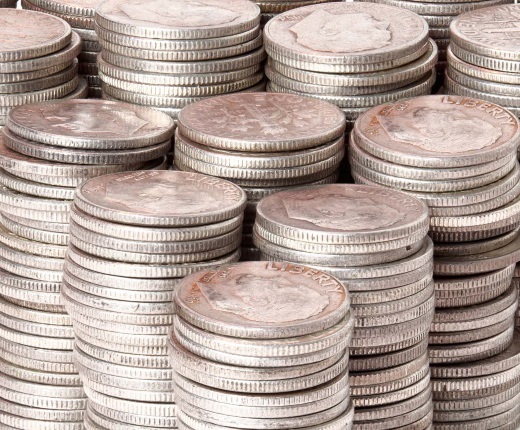 Twice in the past the price of silver has risen in a short period to $50. It happened in 1980 during the Hunt brother’s manipulation and again three decades later in April 2011, when the price rose to nearly $50. Prior to the price run up in 2011, I wrote that a move to $50 was more than possible, since it had already occurred and that proved such a move was possible. Something that has happened twice before can certainly occur again. One thing that makes it probable is that there was three times the amount of silver above ground in 1980 than there is today. The six billion ounces that existed in 1980 has shrunk to two billion ounces of industry standard 1000 ounces bars. The amount of world money creation and buying power has increased exponentially over the past seven years. It is nothing short of extraordinary that there is less than a third of world silver inventories remaining today than there was in 1980 while the price has remained far below the peak it reached back then. In 1980, there were less than 3 billion ounces of gold in all forms above ground throughout the world – the cumulative production of thousands of years. Today, 38 years later, the total amount of above ground gold has doubled, thanks to an explosion of gold mine production.While silver mine production has similarly exploded over the past 38 years, there is much less silver around now. The explanation for why there is so much less silver and so much more gold is that silver is a vital industrial commodity, consumed in a wide variety of applications, while gold is not. Silver lost its primary consumption use - photography, due to digital displacement, but despite this loss, a myriad number of new uses powered silver’s continued consumption.Unlike silver, the price of gold is substantially higher than it was at its peak in 1980. There is no minimizing the powerful dynamics in place for the next move higher in silver. That move should extend far beyond the $50 barrier of the past and, when the move does start, it will most likely unfold much quicker than the previous big moves. When it occurs, most observers will be dazed and confused. The principle dynamic of this coming big move in silver and gold will be the role of JPMorgan.Over the past ten years, as a result of its government-assisted takeover of Bear Stearns, JPMorgan has been the dominant futures (paper) short seller on the COMEX, becoming so powerful that it has compiled a perfect trading record – never once taking a loss and amassing many billions of dollars of trading profits. As remarkable as this unblemished trading record of the past decade has been, it actually pales in comparison to what JPMorgan has been able to accomplish in the physical market. It has used the highly depressed prices it largely created to accumulate on the cheap 750 million ounces of physical silver and 20 million ounces of physical gold. The accumulation of such a massive private hoard of physical silver and gold, by far the largest such amounts in history, is the single most powerful argument that the coming move higher will be one for the record books. JPMorgan is the unchallenged master of the financial universe and it didn’t go to the trouble of accumulating such massive and historic quantities of physical silver and gold for a quick trade or a small gain. It did so in order to make the largest profit in history. I understand that many doubt my claims that JPMorgan has amassed 750 million ounces of physical silver and 20 million ounces of gold. After all, aside from the near 150 million documentable ounces of silver that JPMorgan holds in its own COMEX warehouse proof of the other 600 million ounces that JPM owns is notably missing. Certainly, if the entire 750 million ounces could be seen by everyone, there would be no debate. It is precisely because most of the silver held by JPMorgan can’t be seen that makes my claim noteworthy. As it stands, JPMorgan’s accumulation of physical silver and gold is mostly unknown. I think this is a good thing because when silver does fly higher, no one will be pointing the finger at JPMorgan. They will skate undetected to many tens of billions of dollars of profits with the world blissfully unaware of the real story. It is in JPMorgan’s self-interest to hide from view as much of its silver and gold accumulation as possible. Even though the 600 million silver ounces held by JPMorgan are hidden, I have described in detail to subscribers (and in public articles) the three main means by which it has acquired the metal on a weekly basis going back at least five years. First was via skimming off a small portion of the unprecedented, yet documented weekly physical movement in and out of the COMEX silver warehouses – an inventory movement not seen in any other commodity. Over the past 7.5 years, more than 1.5 billion ounces of silver have physically been moved in and out of the COMEX silver warehouses of which JPMorgan has skimmed off at least 200 million ounces (apart from the 144 million ounces it holds in its own COMEX warehouse). Next, JPMorgan bought at least 150 million ounces of Silver American Eagles and Canadian Maple Leafs from 2011 thru 2016, melting every coin into industry standard 1,000 ounce bars. JPMorgan’s buying alone accounted for the string of record sales years and when it stopped buying, sales of these coins collapsed. Finally, as the official custodian for SLV, the world’s largest silver exchange traded fund (ETF), JPMorgan was ideally positioned to convert shares in the trust to metal and avoid all ownership reporting requirements. This alone is the explanation for the continuous counterintuitive deposits and withdrawals in SLV over the past seven and a half years. All told, JPMorgan picked up at least 250 million ounces of physical silver in this manner. All three of these accumulation methods by JPM were reported weekly to subscribers for years, and I suppose anyone not privy to the reporting would doubt it had occurred. Not much I can do about that. As great as JPMorgan’s massive and historic holdings of physical silver are, remarkably, there is more. Not coincidently, the “more” also involves JPMorgan. At this time, it is accepted that the futures market structure in COMEX silver and gold (and other metals) is the most bullish it has been in history. Specifically, the level of short selling by the managed money technical funds is the highest it has been in history.This is clearly bullish as these technical fund shorts have no choice but to buy back their short positions at some point and switch (or try to switch) to the long side. Thus, a massive amount of potential buying is already in place, awaiting only the eventual occurrence of higher prices to be set off. While the current bullish market structure in COMEX silver and gold is reasonably well known and written about, much less is known about JPMorgan’s role in forming this bullish market structure. CFTC data verifies that JPMorgan has been, by far, the largest purchaser of COMEX silver and gold futures contracts over the past couple of months. In other words, not only has JPMorgan been the largest buyer in history of physical silver and gold over the past seven years it has also been the largest buyer of COMEX futures contracts on the deliberately-engineered price decline of late. By my calculations and based upon CFTC data, JPMorgan has bought back 20,000 COMEX silver short contracts (the equivalent of 100 million ounces) and 90,000 COMEX gold short contracts (the equivalent of 9 million ounces).How many more COMEX futures contracts can be bought by JPMorgan is anyone’s guess, but based upon the record short selling by the managed money traders, it wouldn’t appear that JPMorgan can buy many more COMEX contracts. After all, the record managed money selling is what enabled JPMorgan to buy so many contracts in the first place; once that selling dries up, JPMorgan is unlikely to be able to buy many more contracts as a result. It is the highly concentrated nature of JPMorgan’s futures contract buying that sets the stage for an upside price jolt that promises to unfold faster to the upside than any previous move. So deft has JPMorgan been in buying gold futures contracts recently that I have taken to describing it as a double cross of other traders. But once the move higher unfolds, it promises to be the largest rally in silver and gold in history by virtue of the massive physical hoard accumulated by JPMorgan. Amazingly, all it will take for this price explosion scenario to unfold is for JPMorgan not to add aggressively to short positions when the inevitable rally begins. You heard me right – the silver price explosion to $50 and beyond, along with a commensurate move in gold is only contingent on JPMorgan doing nothing on the next rally. Admittedly, JPMorgan has been in many similar set ups in the past and has always added aggressively to its COMEX short positions, eventually capping those rallies. This has prompted many to assume that JPMorgan will always sell short aggressively on future rallies. But the current set up has never favored JPMorgan this much. If what JPMorgan has always done holds true again we will get a rally of some significance anyway, just not the big one. But if JPMorgan doesn’t add to short positions on the next rally, the third run to $50 silver and beyond should be at hand.